If you follow what passes for news these days (and in today’s always-on digital climate, who doesn’t? ), you’ve probably heard that Clint Eastwood released a new movie just a day or two ago. It’s called American Sniper, he directed it, and it blasted into box office prominence, raking in piles of cash and its fair share of controversy. So, what does a war biopic about Chris Kyle have to do with office furniture? Well, nothing really. Clint Eastwood, however, is another matter. See, over at NotSitting.com, we’ve already covered the good elements of the standing desk – the productivity boost, health benefits, and so on – benefits which have prompted some news outlets to ask if 2015 will be the ‘Year of the Standing Desk’. But until now, we haven’t covered the seamy underbelly of this new fad. In truth, most people don’t even know there is one. By the time you’re done reading this blog post, you’ll be well versed in not just the good, but also the bad and the ugly of standing desks. Sounds like a 1950s B-movie, eh? Well, it’s not (or at least, not that I know of!). Cankles, as 30 seconds on Google, and now this blog post, will tell you, is a hybrid word for the phenomenon of the merging of one’s calves and ankles such that it becomes difficult to distinguish one from the other. While just about anyone can get them, it’s definitely more of a prominent problem in the fairer half of our gene pool – women who are, shall we say, “stout” and / or “matronly” often sport them, but another cause is, you guessed it, periods of prolonged standing in one spot. The problem is only exacerbated by the use of high heels or other uncomfortable shoes. Of course, it’s not just a fashion or a gender issue – it’s a health problem! The swelling in your lower extremities which manifests itself as an onset of cankles is due to blood pooling in your feet and lower legs. People who are just switching to standing desks from a more sedentary work environment are especially prone to the condition; bad habits from years of sitting in one spot for hours at a time can carry over to a new work style. Of course, one of the best things about using standing desks is that you’re free to walk around or sit down every now and again – to avoid the cankle curse (and other issues yet to be discussed), we suggest doing just that. Speaking of transitions, let’s talk about a rough one that needs more attention. While the health benefits and other bonuses of using a standing desk can’t be denied, people often fail to let you in on a little secret: The first few weeks of acclimatization can be rough. As any bus boy, bell hop, waitress, factory worker, or similarly employed person will attest, standing on your feet all day is often every bit as difficult a job as the one you’re actually being paid for! During the initial transition, expect fatigue, aches and pains, swelling, and other unpleasantness. The good news is that unless you’ve got some kind of underlying medical issue, these problems should fade with time. While they certainly don’t have to be, standing desks are absolutely available in a wide array of complex and / or expensive variations. Most companies are on a limited operating budget, so unless you work with a household name, it can be difficult to make your HR department or whoever see the wisdom in the office-wide use of standing desks. After all, don’t you already have a perfectly good desk? And hey, why aren’t you sitting at it, working? Spearheading the move from a seated to a standing workplace can be a daunting task. In fact, you may be labeled the office weirdo for even suggesting it, which is probably why the trend hasn’t caught on more widely up to now; people don’t like to be “that guy” or “that girl”, even if what they’re trying to do is for everyone’s overall benefit. Furthermore, if you do succeed, most management types will end up using the “all or nothing” approach, either dismissing your suggestion out of hand or ordering a ton of fixed-position standing desks. This will, of course, cut out the sit-stand hybrid desk segment altogether. That’s a real shame, too, since some of the best standing desks and standing desk peripherals are entirely based on this type of furnishing. The silver lining is that you can usually make the purchasing agent (or whoever is in charge) in your organization see reason by simply pointing out the sit-stand option; there’s a good chance no one even knows about it. Remember that old slogan about mullets? Well, most office settings will probably frown on an employee sporting one. The same goes for shoes. Most offices have a dress code, and if you come in wearing ratty but comfortable sneakers or Crocs or whatever else you can find to keep your feet from filing a human rights violation while they adjust to the use of your new standing desk, you’re probably going to be in violation of it. Loafers for men and heels or flats for women, then, are still the go-to choices for office footwear. Happily, things like Dr. Scholl’s inserts and the like can provide all the padding and arch support needed, and at bargain prices. If you really need to bring in the big guns, prescription orthotics are also an option – just talk to your doctor. This helpful reminder is stenciled on the dispersal side of each and every claymore anti-personnel mine used in the United States military. While it might make you laugh, it’s there to remind you that used improperly, even the best of tools can wreak havoc on the user. 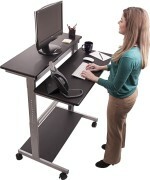 Standing desks follow the same principle. Standing in one spot for hours on end, even for seasoned users, can end up subjecting you to all sorts of health issues that are every bit as dangerous as the ones you were trying to escape by ditching your seated desk. Back, leg, and knee pain, wrecked posture, and of course, cankles – pools of blood where none should exist are really no laughing matter! – are just the start. Luckily, as mentioned above, the solution is as simple as taking five or ten minutes to sit down or walk around two or three times a day and adding a standing desk mat to help fight fatigue. This will keep your blood flowing as it should and go a long way in diminishing other unwelcome symptoms you’d otherwise fall prey to. Well guys, there you have it: The good, the bad, and the ugly of the standing desk. Like they say, forewarned is forearmed… or fore-legged, or… well, you get the point! I hope you all get some useful info out of what you’ve just read, because standing desks really are great tools, and it’d be a shame if you never got to experience one for yourselves. Thanks for stopping by. See you next week!